Never miss a sunset over the Gulf of Mexico from this island retreat. 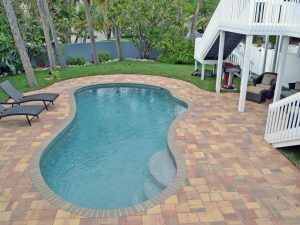 Located just a short walk to the beach, this two story home with private heated pool can accommodate you and up to 5 of your guests with comfort. Step into the home through the front door from the oversized deck into the open living area furnished with seating for four and large flat screen TV. The dining area, just off the kitchen has seating for 6 and has large french doors leading back out to the deck. The kitchen is fully equipped with 4-piece stainless steel appliance package among other small kitchen appliance to suite all your cooking needs. The first of three bedrooms is located on the main floor with ensuite bathroom and furnished with a queen-size bed and TV. Upstairs you will find the two additional bedrooms which share the second bathroom. One of the two upstairs bedrooms is furnished with a queen size bed, large flat screen TV, and walk-in closets. Enjoy cool Florida mornings from this room’s private balcony. The third bedroom is furnished with two twin-size beds as well as a TV. Outside there is plenty of room for pool side relaxation and barbecuing.